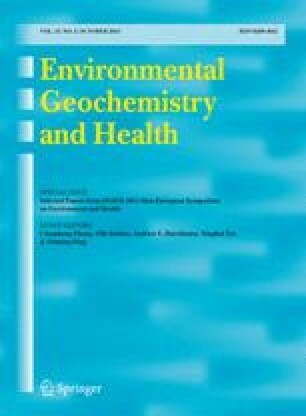 A systematic survey on the distribution of geochemically and texicologically relevant trace elements in the soils of Italy was carried out on 32 soil profiles, developed in different environmental and pedological conditions. The aim of this study was to collect basic information on the background levels of trace elements, their geochemical behaviour and the relationships between weathering and pedogenetic processes. The statistically processed analytical results led to the following conclusions: (i) Trace element distribution in the profiles studied is consistent with pedochemical behaviour and rock lithology. A comparison with the world soil means shows that there are no significant differences, except for those elements largely utilised in agriculture (Cu, Zn) or, because of pollution, (Pd, Cd), or natural accumulation (Ni, Cr); (ii) data processing by cluster analysis shows marked correlations between some elements, for example, Al-V, Ni-Cr, Mn-Co. Groups of geochemically homogeneous samples, which correspond to the great soil families characteristic of each pedological landscape, are also indicated; (iii) evidence of soil contamination is provided by the high levels of some elements, especially in the A horizon. Cu and Zn seem to be concentrated in the Ap horizon of cultivated soils, while Pd and Cd may be derived from the atmosphere.